This Sunday was a brutal day for sports bettors as big public favorites all fell short. START YOUR OWN SPORTSBOOK - WHY BE AN AFFILIATE WHEN YOU CAN GET 100% OF WINNINGS? 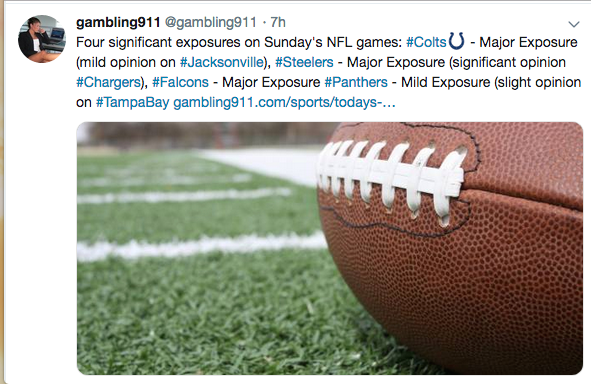 Books made out like bandits Sunday with the biggest early exposure being Indianapolis playing in Jacksonville and losing in a 0-6 yawnfest. Atlanta fell to the Ravens at home 16-26. It didn't matter that the Falcons were so heavily wagered from a +2.5 dog to a -2.5 home favorite. Next on the list, the Panthers, also losing to the Bucs 17-24. The biggest exposure of the weekend? That was the Pittsburgh Steelers. Sure it looked like the Steelers would easily cover against LA. In the end, the Chargers came back to win by 3 points. Needless-to-say, it was a very good day for the books.